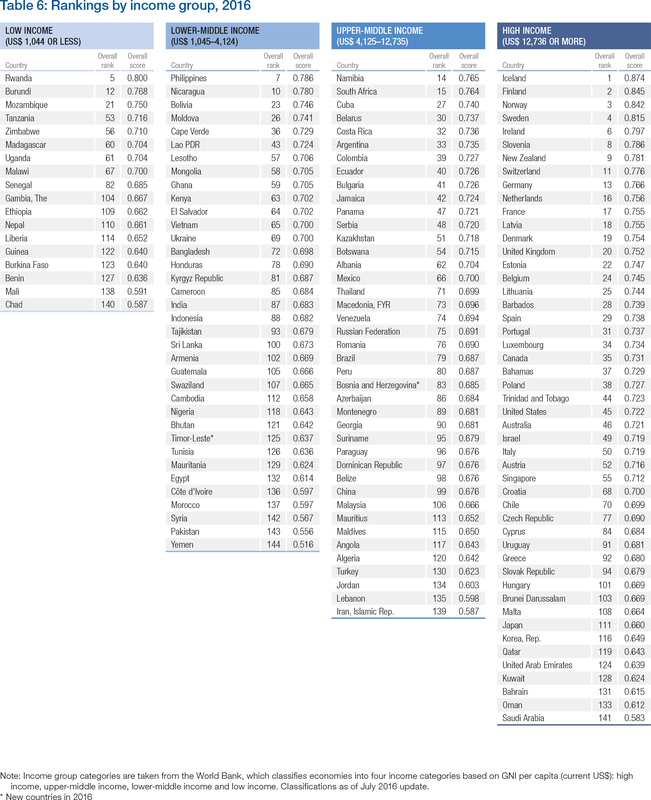 Table 6 displays country rankings by income group (Table A2 in Appendix A details the income group categories used). In 2016, the best-performing high-income group countries are once again the Nordics—Iceland, Finland, Norway and Sweden—which are also the overall leaders of the Index, while Bahrain, Oman and Saudi Arabia are the lowest-performing countries in this income group. Among the upper-middle income group, Namibia, South Africa and Cuba lead the way, whereas Jordan, Lebanon and Iran, Islamic Rep. are the bottom performers. In the lower-middle income group, the Philippines, Nicaragua and Bolivia take the top spots while the lower end of the group is made up of Syria, Pakistan and Yemen. Finally, the low-income group—consisting mostly of Sub-Saharan African economies—is dominated by Rwanda, Burundi and Mozambique, with Benin, Mali and Chad comprising the lower ranks. 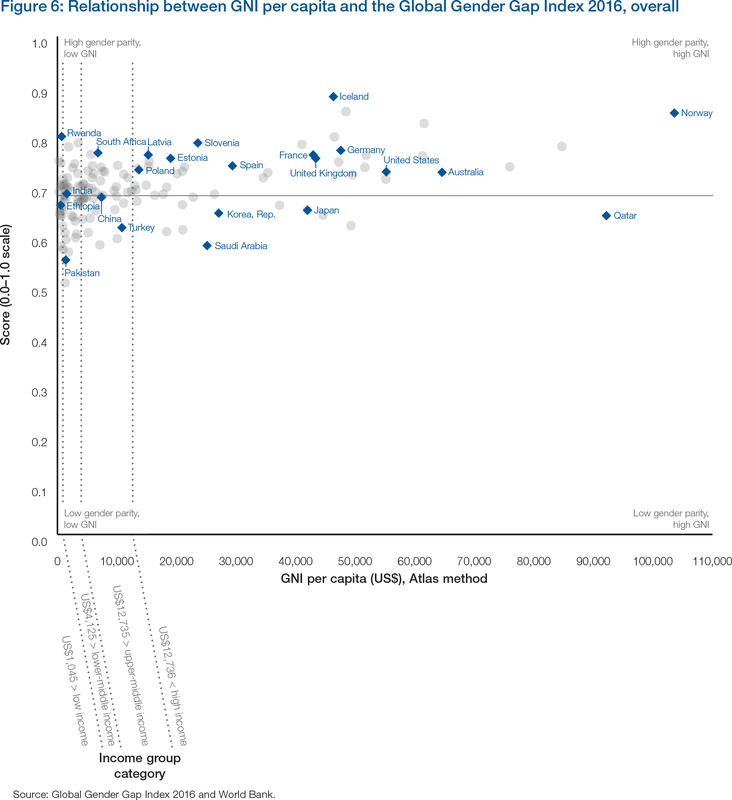 The bottom part of Figure 4 shows the range of scores for the overall Global Gender Gap Index by income group. Population-weighted group averages are indicated by a blue diamond. High-income countries have the highest average score (72%), followed by low-income countries (68%), upper-middle income countries (68%) and, finally, lower-middle income countries (67%). However, as revealed in Figure 4, there is a wide variety of gender gap outcomes across every income group. In 2016, out of the 49 countries in the high-income group covered by the Index, four have closed more than 80% of their overall gender gap, 28 have closed between 70% and 80% of their gender gap, 16 have closed between 60% and 70%, and one country is yet to cross the 60% threshold. Among the 41 countries in the upper-middle income group, 16 have closed between 70% and 80% of their gender gap, 23 have closed between 60% and 70%, with two countries having closed less than 60%. In the lower-middle income group, out of 36 countries, 13 have closed between 70% and 80% of their gender gap, 18 have closed between 60% and 70%, and five countries have not yet reached 60%. Finally, among the low-income group, out of 18 countries, one has crossed the 80% threshold, seven have closed between 70% and 80% of their gender gap, eight have closed between 60% and 70%, and two countries are yet to close 60% of their gender gap or more. 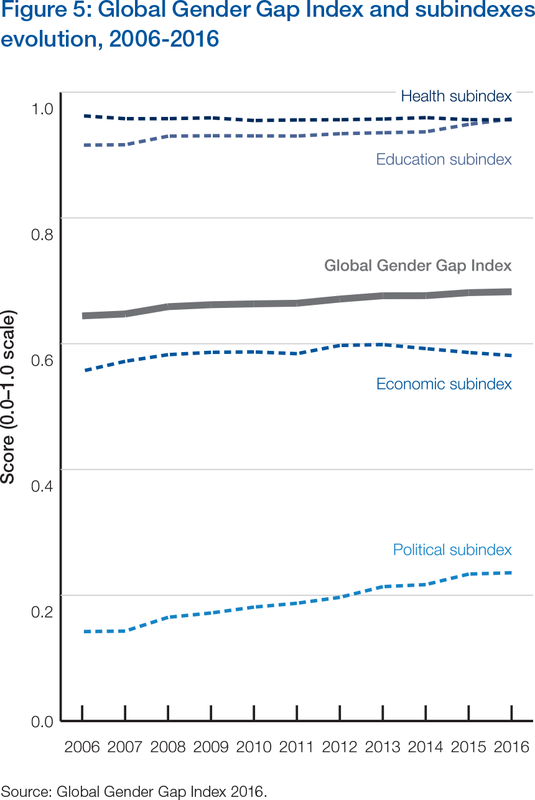 While the above does suggest a relationship between gender parity and gross national income—with a growing body of research and evidence strongly suggesting that gender parity can become a key driver of prosperity and national income growth (see Figure 6)—the Index finds little evidence that a high GNI is in any way a prerequisite to making progress on gender parity. Appendix B illustrates the spread of data for female and male values for all 14 indicators used in the Index in 2016 in a single visualization. Appendix C contains detailed data tables, in rank order, for all 14 indicators included in the Index for all countries for which data was available in 2016.